Darkness gains when anyone stands silently by as elected leaders and representatives speak words of hatred and divisiveness, and legislate and order the dissolution of basic rights proven regulations that protect our citizens and residents from environmental dangers, predatory marketers, inequality in availability of health care just to name a few. Most important for us to remember and emulate is the courage and dedication; the hope and affirmation that this man of rare character and profound humility displayed–and in the most dire of times and circumstances. My brief but profoundly transforming experience marching with Dr. King and later with others in the Civil Rights movement has remained with me as a keystone in my life’s decision to serve all humanity. There is no question that more than ever we need more people like Dr. King and we need to educate others to the principles that he lived and died to protect. 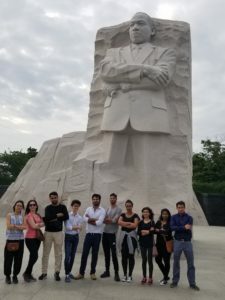 On this day we are reminded of how much work needs to be done, and reminded of the efforts still to be directed toward creating and sustaining a just society where people of all races, religions, nationalities, and orientations have a place, a voice, and a future where they can and will continue to contribute to the Common Weal. I encourage you to tweet, blog, and post positive and inspiring messages today, messages that affirm the meaning-Full life of Dr. King. Let’s make 2018 a year where we challenge ourselves and others to more goodness, more service, more love for one another. Let Dr. King’s dream and sacrifice be our call to sustained action until that day when his resounding words become a part of our being– spoken and acted on, each in our own unique way.